The daughter of a Norwegian immigrant, Carol McLeod was introduced to crafts at a very early age, primarily traditional Norwegian crafts. Even before she could read, Carol learned to sew on an old White treadle machine -- she had to stand up to work the treadle because when she was seated, her feet didn't reach the pedal. Her mother inspired Carol to create, and to this day Carol loves to figure out how to create something new or a different way to use existing materials. 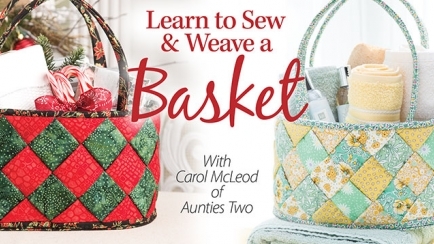 Carol started her pattern company, Aunties Two, after 20 years in the corporate banking world. She shared several of her creations with a local quilt group. They wanted to make her beautiful patterns, and Aunties Two was born. Today, Aunties Two creates new and unusual bag patterns galore, as well as baskets, bowls, boxes and rugs, with new ideas coming all the time. Carol says, "I have always loved to sew. Just put me in front of a sewing machine and I'll create. 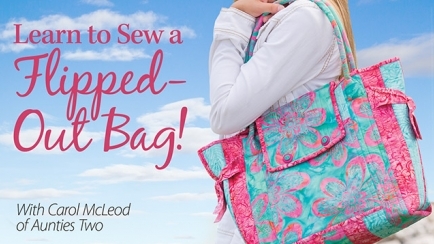 My passion is to reach into the scrap bag and make something new and a bit different, to manipulate fabric, to make someone smile and say, 'That's cool!'"